Based on the Sharon Tate murders (carried out at the behest of Charles Manson), this home invasion horror from Annabelle director John R Leonetti is a deeply distasteful mess. Unsure of whether it wants to be a true crime reconstruction or a stylised and lightly fictionalised version of the story, the film lands awkwardly between the two and ends up being extremely offensive in the process. 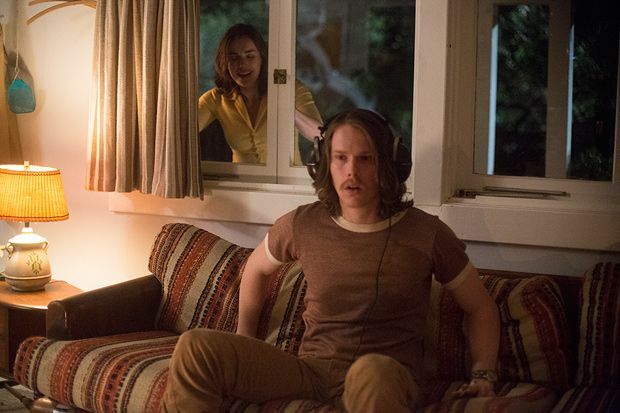 Set in August, 1969, the film begins with four friends – pregnant movie actress Sharon (Katie Cassidy), coffee heiress Abigail (Elizabeth Henstridge), Abi's boyfriend Wojciech (Adam Campbell) and Sharon's friend Jay (Miles Fisher) – returning to their rented home in the Hollywood hills after a night out. Meanwhile, four silent figures – one man and three women, whose faces are never seen – brutally murder a young man (Lucas Adams) who had been visiting the property and slowly make their way up to the house, intending to slaughter everyone inside. It's not the performances that are the problem (all four leads are familiar TV faces). By opting to keep the real names of the victims, as well as key details like Sharon being heavily pregnant, Wolves at the Door deliberately positions itself as a re-enactment. That's tasteless enough, but it also means that the film is immediately stripped of suspense, since the audience will already be aware of the story's grisly outcome. Leonetti opts for the usual jump scares (fireworks, blenders springing into life, etc) and cheap horror tricks like having the killers walk through the house, glimpsed by us but unseen by the inhabitants. However, when it comes to the actual murders, the film is surprisingly tame, with the majority of the brutality happening off-screen and one key murder not shown at all, almost as if somebody involved with the production realised halfway through how boneheaded the idea was and tried to mitigate as much as possible. That would also explain minor tweaks to the details, like shifting the locations of some of the killings, which only makes the whole thing even more disrespectful. One to avoid. General release from Fri 17 Mar.